It’s been awhile since we last shared news but we were busy marching #50MilesMore last month! 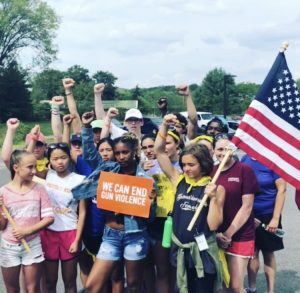 We are so proud of our students for using their voices and their feet for gun violence prevention. Sept 20th-30th – The national Concert Across America to End Gun Violence continues in Hyannis on Sept 25th (Tuesday) at 7pm and Gloucester on Sept 27th (Thursday) at 4pm. Sept 27th (Thursday) – League of Women Voters (Needham MA) Gun Violence Forum. Oct 11th-12th – God and Guns: Faith to End Gun Violence – Training – New York City, Winston-Salem North Carolina, Dallas. Oct 19th-21st – Student Gun Violence Summit – Washington DC. Yes, it’s true. 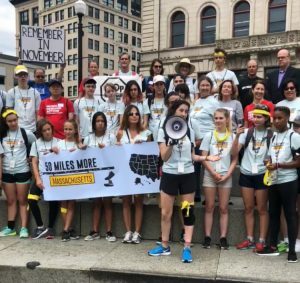 Students from across Massachusetts marched 50 miles from Worcester City Hall to Springfield. They succeded in amplifying their message to demand Smith & Wesson to stop exporting firearms from Massachusetts that are illegal to sell within the state, and to demand from them to be part of the solution to end gun violence. While their message was spread across the country by the Associated Press and internationally by the Guardian, Smith and Wesson failed to address their demands. But the students will not give up. Stay tuned for continued student action in the months to follow. Smith & Wesson has also gained the attention by a minority group of shareholders, Nuns and other Catholic activists. At their annual meeting on September 25th, investors will consider a proposal that would require the company to prepare a report on the risks of selling firearms. In case you missed it, Governor Baker signed ERPO into law in July. Plus, $8M was provided in the budget passed and signed by Governor Baker that will help the state continue to address urban gun violence via the Safe & Successful Youth Initiative (SSYL). In Newburyport, civil conversations on both sides of the gun violence debate can be had between GOAL and Massachusetts Coalition for Gun Violence Prevention. Gun violence prevention advocates sharply criticize nominee to the US Supreme Court Brett Kavanaugh on his dangerous judicial record. Education Secretary DeVos says she has no plans to take a position on any plan by school districts to use federal funds to purchase firearms. Student organizers will display life-size statues of student lock down drills created by artist Manuel Oliver, whose son Joaquin was killed in Parkland. Californians try a new tack to reduce gun violence – ammunition legislation. Plus, California orders the NRA to stop selling firearm insurance without a state license. Amnesty International proclaims gun violence in America as a human rights crisis. Childrens’ easy access to unsecured firearms result in deaths in Kentucky. John Hopkins reports a critical gap in gun violence data. Children’s Firearm Safety Alliance published their report of 2017 incidents.